This was the scene of a German gas attack in April 1916, fought off by the 3rd and 24th Divisions. Packhorse Farm was the name given to a farm on the eastern side of the most direct road from Lindenhoek to Wulverghem, and this cemetery was one of two made by the 46th (North Midland) Division during their occupation of the sector in 1915. Of interest is the sad fact that two brothers are buried here- Privates Ernest Arthur and James Emerson Proctor of 1st/5th Bn. Lincolnshire Regiment, from Scunthorpe aged 22 & 21 respectively. Both were killed on the same day, May 20, 1915, either through an enemy mine under their trench in the Dranoutre sector, or through the subsequent rescue attempt. An especially evocative name today, Kandahar Farm is roughly eleven miles south of Ypres on the Niewkerkestraat (N314) which leads from the N365 connecting Ypres to Wijtschate, Messines and on to Armentieres. 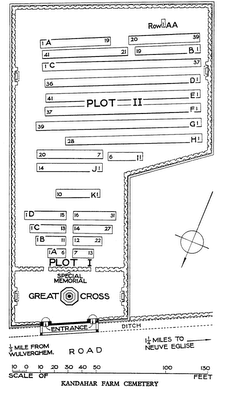 The cemetery is near Wulverghem and the front line ran a little east of the village. 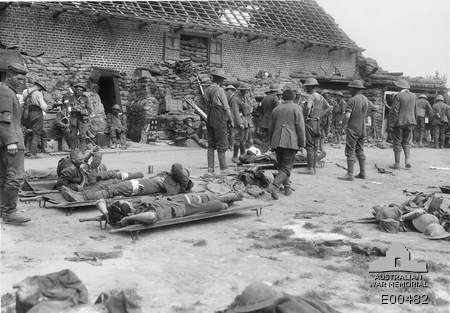 A 3rd Australian Divisional Field Dressing Station at Kandahar Farm, on the afternoon of 7 June 1917, during the Battle of Messines. Belgian memorial to their dead. This small communal cemetery holds the dead of two world wars. The churchyard was used by field ambulances and fighting units at intervals during the war and later saw service in the Second World War when the British Expeditionary Force was involved in the later stages of the defence of Belgium following the German invasion in May 1940, and the subsequent withdrawal to Dunkirk. Courtrai used to serve as a major base for the German army which would fall to the 9th Division on October 17, 1918. The Union Flag carelessly flown upside down over the graves of 221 Great War and 34 Second World War Commonwealth soldiers. Courtrai had been heavily bombed in the summer of 1917, but even more damaged by the allied bombing in 1944. Bissegem is 2 km west of Courtrai town centre.